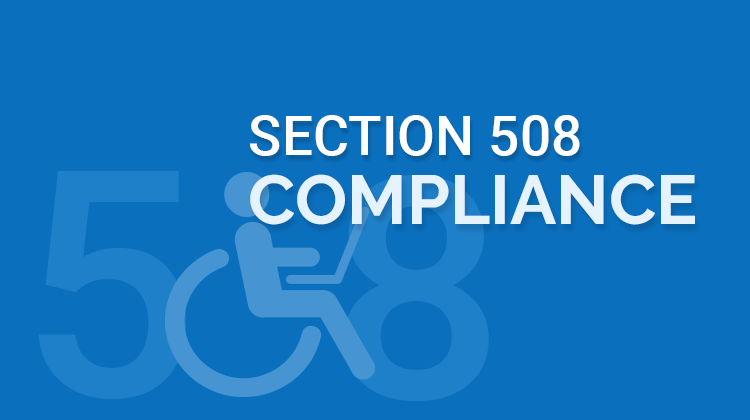 The Section 508 Standards are part of the Federal Acquisition Regulation (FAR) and address access for people with physical, sensory, or cognitive disabilities. They contain technical criteria specific to various types of technologies and performance-based requirements which focus on functional capabilities of covered products. Specific criteria cover software applications and operating systems, web-based information and applications, computers, telecommunications products, video and multimedia, and self-contained closed products. It is a compliance standard set by Section 508 of the Rehabilitation Act of 1973 that requires federal agencies to provide software and website accessibility to people with disabilities. It is pretty much essential for developers and testers to understand actual guidelines of accessible software in order to identify whether those requirements are met or not. From usability perspective of colorblind people, all the images on the website need to include ALT TEXT in the code or in captions. Using different colors as a navigational tool may cause problems to colorblind people. For people who can not use a mouse can make use of keyboard thus adding headers, other required elements are also essential. Video-based websites should have synchronized captioning and Audio based should have transcripts since the use of multimedia requires additional measures for accessibility. Files where a user needs to fill up the details and submit forms such as PDF’s, other documents should be accessible to users with screen readers and other related technologies. What to-do under section 508 testing? This ensures that user can perform product functions that can be identified or labeled with text can be performed from a keyboard. People with physical disabilities having difficulty in holding or controlling a mouse or other pointing device may find it more efficient to use a keyboard as their input mode. In this way, users can navigate through the screens of an application using keystrokes rather than a mouse. This provides device-independent support that includes keyboard access as one method of interacting with an application’s functionality and make the application usable for all types of users. This ensures that system features do not disrupt accessibility features of either the operating system or of assistive technology running on a machine that is used by persons with disabilities. This ensures that a well-defined on-screen focus allows users to navigate and interact more easily with an application. For Assistive Technology users, the focus must be programmatically exposed. This focuses on how to determine if the user interface elements of an application are accessible. This ensures that sufficient information about a user interface element including its identity, operation, and state of the element are available. This ensures that meaning of a particular bitmap image must be the same throughout an application which means each image indicates the same functionality everywhere it appears in the application. Screen reader applications do not allow two different labels for the same bitmap image under this module. This focuses on how textual information displayed on web pages. Information should be provided through operating system functions for displaying text and the same must be conveyed through the operating system or through a documented API. This covers customized display settings (including contrast and color) by the user and provides methods of testing to check these settings are not disabled/override by an application. Applications must not disable or change user-selected display settings under any circumstances. This makes sure that information conveyed by an application through animation is accessible to all users. In some cases, animation can be distracting and even inaccessible, so users should always have an alternative option. These options must provide the same information and equivalent functionality in that application. This ensures that an alternative method of conveying information is provided in addition to color. When items that solely use color to convey information, an alternative must also be available in the form of textual. This ensures that all users have access to customize color and contrast settings that work best for them in an application. This deals with the flicker or blink rate of objects, text and other elements that are displayed. Reasons for setting this rate is to meet certain parameters when flashing or blinking elements are used. Software should not use flashing or blinking text, objects, or other elements having a flash or blink frequency greater than 2 Hz and lower than 55 Hz for the people with photosensitive epilepsy (are at risk for having seizures). This focus on the accessibility of web forms and controls added in that. These designed and developed electronic forms should allow user for keyboard access. All the guidelines that apply to the rest of the application should be applicable to electronic forms as well. What was covered under Section 508 testing? There are many measures by which one should be able to test particular website to ensure it is compliant with the standard and depending upon domain or any other business logics of applications scope of testing changes too. Verification 1: Every image, applet, embedded media, plug-in, etc. that conveys content has equivalent alternative text (alt, longdesc, or in the element context). Verification 2: The alt text succinctly describes the content conveyed by the element, without being too verbose (for simple objects) or too vague (for complex objects). Verification 3: Images that have a function (images within links, image buttons, and image map areas) have alternative text which describes the associated function. Verification 4: Decorative graphics are CSS background images or have null/empty alt values (alt=””). Images with text alternatives in element content are given empty alt text to avoid redundancy. Verification 1: Color is not used solely to convey important content. Verification 2: Sufficient contrast is provided. Verification 1: Data tables have column and/or row headers appropriately identified (using the <th> element). Verification 2: Tables used strictly for layout purposes do NOT use the <th> element. Verification 1: Data table cells are associated with the appropriate headers using the scope or id/headers attributes. Verification 1: Each frame is given a title that describes the frame’s purpose or content. Verification 1: A link is provided to skip over navigation menus or other lengthy lists of links. A good heading structure also facilitates navigation. Verification 1: The user has control over the timing of content changes. Verification 1: Microsoft OS “Narrator” software produces an auditory version of the digital content. Narrator allows users to interact with a website using voice commands. A narrator reads details present on an active web page and helps blind or visually impaired users to access the application. Verification 2: Test in multiple browsers like Internet Explorer and Firefox on Windows with Narrator.